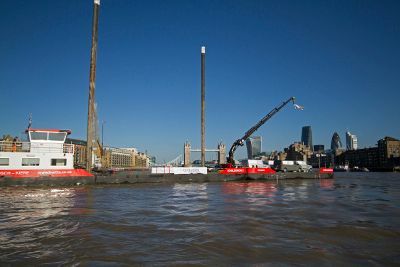 London, 21st July 2015 – A unique self-powered work barge and sister vessel are going into service on the River Thames today. Launched in a partnership between Southwark based operator Livett’s Group and Belgian owner Herbosch-Kiere, the Scheldemond I & II are set to provide a significant efficiency boost for central London civil engineering contractors. An event taking place today billed ‘Better by Water’, will mark the availability of Livett’s Group’s new vessels whilst focusing on the benefits to the city of using the Thames for commercial projects and transport. 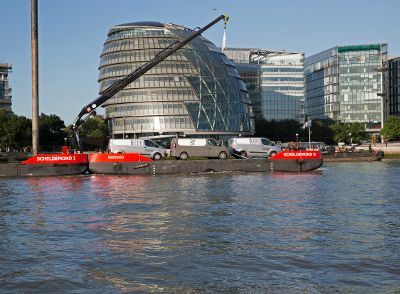 The latest additions to the Livett fleet are part of growing the use of the Thames for moving construction and other materials for some of London’s biggest development and transport schemes. In the last five years use of the river has more than trebled, to over five million tonnes in 2014 (Port of London Authority figures), keeping more than 265,000 lorry trips off London’s congested roads. The Scheldemond I & II are available for hire for engineering and construction projects on the river but can also carry large loads to support commercial logistics. Together they provide an alternate means to transport goods and vehicles in London that will keep even more HGVs off the streets, helping to lower carbon emissions in the city. This will significantly improve safety and air quality for cyclists and pedestrians and in particular the local communities around riverside construction sites. “By adding Scheldemond I & II to our diverse portfolio of vessels, we are expanding engineering capabilities and transport capacity on the Thames. This new lower-cost logistical solution introduces clear safety benefits – fewer HGVs on London’s roads reduces traffic and makes for a much safer, cleaner environment for residents, workers and tourists,” said Chris Livett, founder and owner of Livett’s Group. The 32.5 metre self-propelled Scheldemond I is the primary vessel of the pair. It connects to the Scheldemond II barge to create a uniquely shaped 54 metre long, 7 metre wide transport and work platform that can operate under its own power, unlike most work barges on the Thames which require a tug to move. This makes Livett’s Group’s new vessel a highly flexible tool for on water and river bank engineering and construction projects. Additionally, Scheldemond I & II will be used for a wide variety of applications ranging from diving, surveys and bridge inspections to film production and events. The design of Scheldemond I is state-of-the-art in the world of inland waterways barges. As a self-powered vessel, it features an innovative hydraulic wheelhouse which moves up and down, so that it may pass under low bridges, ensuring it can operate anywhere on the Thames. Uniquely, a high capacity 10 tonne crane is mounted on a track that runs across Scheldemond I & II, providing levels of flexibility for vehicle and goods lifting unheard of on the Thames before. Scheldemond I is also the only self-powered work platform on the Thames with hydraulic self-operating spud legs. “The introduction of Scheldemond I & II to the Thames brings modern, safe, versatile marine equipment to a market that has significant growth potential in the coming years. We are delighted to have the opportunity to align with Herbosch – Kiere, building on our collaborative approach to facilitate the right partners with first class personnel and equipment. This relationship harnesses international strength with local knowledge,” comments Chris Livett. Established in 1983 by Chris Livett, Waterman to HM the Queen, Livett’s Group has developed a reputation for excellence on the River Thames and associated waterways, offering a comprehensive range of marine logistics, civil engineering, and towage services. The dynamic fleet provides solutions for numerous project types and includes commercial vessels such as barges, pontoons, tugs, work boats, and other specialist craft. Herbosch-Kiere Marine Contractors is the UK based subsidiary of Herbosch-Kiere, a leading European contractor. Core activities include maritime construction, demolition and heavy lifting. Clients range from local authorities port and harbour operators, to oil and gas companies. The company focuses on projects with a high degree of technical difficulty or logistical problems, where its engineering expertise provides safe, innovative and economic solutions.